Located on the Upper Little River in Harnett County, Little River Eco Farm is the 14 acre farmstead of John and Mary Jane Bartlett. We raise pastured livestock based on principles of sustainable agriculture on our farm and on additional leased acreage nearby. As a Wildlife Ecologist (John) and an Environmental Engineer (Mary Jane), we believe in being good stewards of our land while providing our customers (and ourselves) with healthy, wholesome, delicious meat. We started the farm in 2012 when Mary Jane was looking for a career change and wanted to get back to her “green” roots. We already owned the farm and had some experience with horses and chickens.Getting started in sustainable livestock farming, we raised a variety of livestock from turkeys to rabbits to goats but settled on beef cattle and hogs as our primary focus. We had no idea what we were getting into but have loved every minute of the journey. 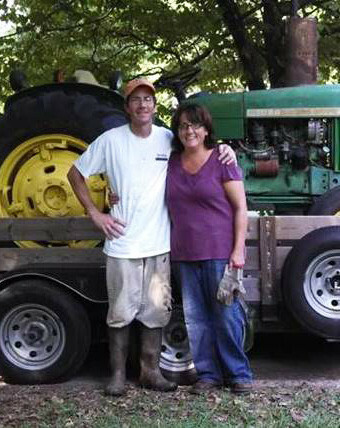 Mary Jane is the owner/operator of the farm with John and others providing A LOT of farm labor. Our pigs remain on pasture their entire lives in the company of other pigs of similar size. They are free to roam and root in our large paddocks and are provided shelter to use if needed to escape inclement weather. Our sows also farrow on pasture in huts designed to provide shelter from the elements for piglets and supplemental heat is provided, if needed. Sows stay where they are meant to be, in contact with the soil, which also benefits the piglets. As day-old piglets start to root the soil, they are taking in needed iron and microorganisms to support their digestive health and build immunity. In contrast, standard commercial farrowing consists of large indoor farrow barns with plastic slat flooring or concrete.The sows are penned in so they cannot even turn around. Once the piglets are born, they have a slightly larger area to move around in while still accessing the confined sow to nurse. Iron injections have to be given in the first few days or the piglets will fail to thrive. Once a weaned 6-8 month old calf arrives on our farm, it goes directly on grassy pasture where it will remain. Cattle are rotated to fresh grass as needed as they consume the biomass. 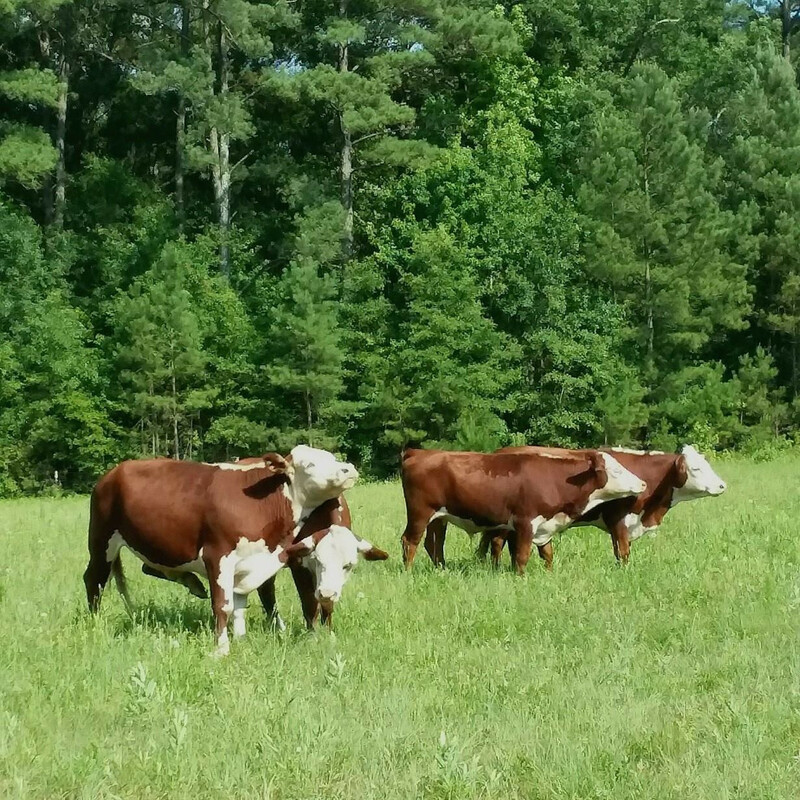 We aim to raise our cattle to meet or exceed American Grassfed Association standards. The benefits of grassfed beef are becoming better known: improved flavor, a fat profile rich in beneficial Omega 3 fatty acids, no added hormones or growth promoters, and no sub-therapeutic antibiotics given. In contrast, typical production of beef in the US includes the use of artificial growth promoters (hormones) and finishing the last 60-90 days, predominantly on corn, in Confined Area Feeding Operations (CAFOs). The corn diet disrupts the bovine rumen and compromises their immunity. Their immunity is further stressed by the packed conditions of the CAFOs thus requiring the use of antibiotics to prevent the animals from becoming sick by the inhumane conditions their managers have placed them in. Both Mary Jane and John have professional degrees and environmental backgrounds. Thus, a strong environmental ethos prompted the naming our farm Little River Eco Farm. We believe in taking care of our land so that native wildlife can benefit from it’s use while minimizing our operation’s environmental impact. For example, all our livestock are rotated from pasture to pasture. This allows their fertility to be spread, thus minimizing additional fertilization needs, and allows for recovery of vegetation. Our goal is to never have bare dirt under our animals’ feet. 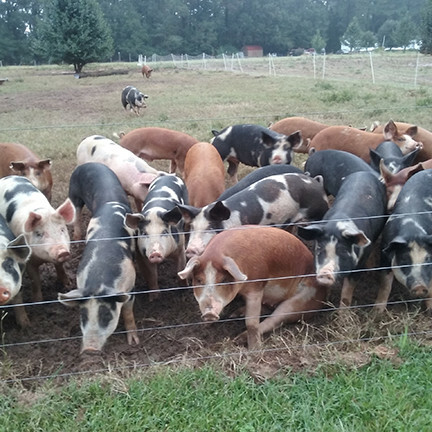 For pigs, this means having a pasture reconditioning protocol in place as pigs are particularly hard on the land. After a group of pigs has eaten the vegetation, rooted, and otherwise trampled down a paddock, they are moved to a fresh area. The paddock is then tilled and graded as needed to level it off, and then reseeded with annual forages. The type of forage planted depends on the time of year and the particular needs of the pasture (fertility, soil organic matter, etc.) and its planned future use. Each paddock ends up being occupied less than 50% of the time. Maintaining this vegetation cover also minimizes runoff of nutrients and soil into the adjacent Upper Little River, which feeds into the Cape Fear River about 1.5 miles downstream. Keeping and cycling nutrients on-farm helps minimize the need for outside inputs like chemical fertilizers. In addition, we do not broadcast herbicides for the protection of the river system, our animals and the quality of the meat we produce. Additional sustainability measures include reusing and repurposing materials, often sourced from defunct farms and other enterprises where it would be burned or shipped to a landfill. For example, our barn is constructed of approximately 80% wood reclaimed from an old barn and a wooden fence. In addition, we harvest rainwater from the barn roof for distribution to livestock to minimize groundwater extraction from the on-site well. To support bird and wildlife populations, we maintain natural wooded areas, beneficial plants and brush piles for natural cover.